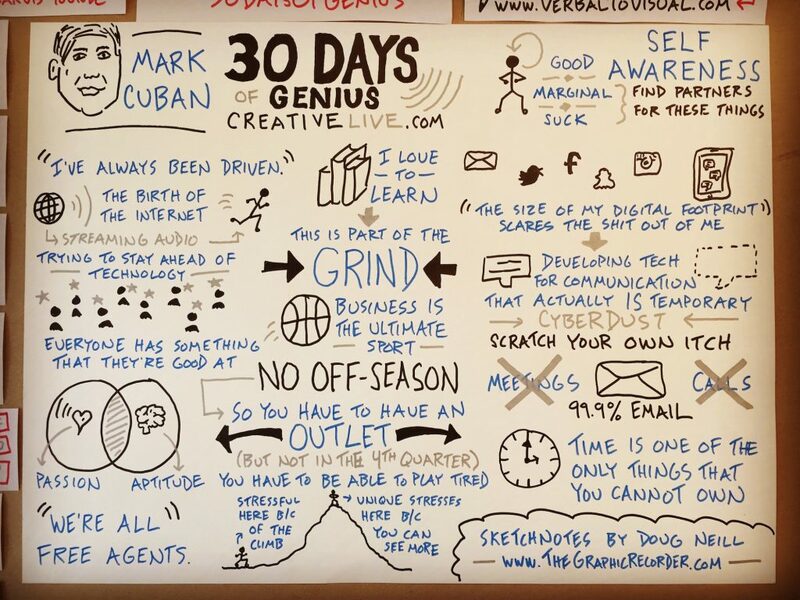 The online education platform Creative Live just launched a new series called 30 Days of Genius – daily interviews with some of the most creative and inspiring folks around. In the spirit of Creative Live, I thought I’d try out an experiment in live sketchnoting: on Verbal To Visual’s Facebook page I’m live-streaming video as I sketchnote each interview. The idea that resonated the most with me is that there’s no off-season in business. As I continue to build Verbal To Visual and now Learn In Public, I’m recognizing both the need to play while tired and also the need to have an outlet that allows me to step away from the business and recharge. For the latter I rely on small-scale sabbaticals every seven weeks. To catch the next live-streamed sketchnote, keep an eye on my Facebook page!